Start your year by simplifying your space. Want to get your closets cleaned out and organized, but worried about committing to the task? Getting organized requires putting in some time and eliminating things, but the benefits are well worth it! Being organized requires discipline and good habits. Designating an appointed place for everything in your home sounds trite, but it will change your day-today routine significantly. The benefits of being organized are numerous. When I’m helping a client get organized, my favorite words to hear are “I’ve been looking for this!” Did you know that the average person loses 45 minutes a day looking for things? Think of how much time would be saved if you just knew where everything was. Trust me, finding your shoes where they belong in the morning is an exhilarating experience. Bonus: Saving money is a wonderful benefit of being organized – you won’t purchase duplicate items if you know what you already have. Are you ready to get organized yet? Think of the peace of mind you’ll have when it’s all done. No more throwing things in the closet before company comes by, or digging frantically through piles for the outfit you have in mind for your day. 1. Sort and categorize each item – group dresses together, jackets together, shirts, skirts, sweaters, etc. 2. Arrange each category by color, from light to dark. For example, begin with your white tops. Then arrange your beige, yellow, red, green, blue, brown, gray, and end with your black tops. Expect surprises. Who knew you had 20 white shirts? This system may seem a bit obsessive-compulsive at first, but it works. The advantage is that every item is visible and accessible. You should be able to walk into your closet blindfolded and put your hands on your white tops. You should be able to walk into a clothing store, close your eyes and visualize your current inventory of clothes in your closet. 3. Say good-bye to the clothes you don’t wear. • Did you know that 20 percent of your clothes get 80 percent of the wear? If you have not worn an item in 12 to 18 months, get rid of it. • Get rid of clothes that don’t fit you anymore. 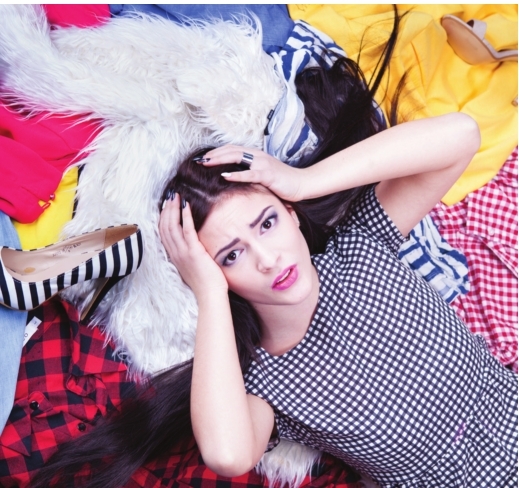 There is no worse torture than keeping a closet full of gorgeous clothes that don’t fit. Keep the items that can be tailored, and pass on the items that are several sizes in the past. • Clothes or shoes that cannot be repaired, fabrics worn shiny from wear and cleaning, suede or canvas shoes that are irreparable, clothing with permanent stains, etc. should definitely be tossed. • Get rid of uncomfortable clothes – itchy sweaters, ill-fitting tops, etc. • Don’t hang up clothes for the memories. If an item holds sentimental value, add it to a special box in the attic – it doesn’t get a spot in your everyday closet. • Last but not least, try on everything you own. This step can be quite exhausting, but do it. Pick a weekend when the kids are busy or your husband is out of town, and have a friend over who can offer helpful feedback. Only keep what you can and will wear happily and stylishly. Don’t forget – opening a closet door in your home should be like arriving at a really good party, where everyone you see is someone you really like. This article appeared in the Monday, Jan. 30, 2017 online edition of The Forum News, Shreveport, LA.